Home security doesn’t have to be an ugly business. Quite the opposite is true, in fact. As the literal entryways into your home, doors should present an aesthetically pleasing appearance that’s simultaneously warm, welcoming and secure. An artistically designed wrought iron door fits the bill perfectly. 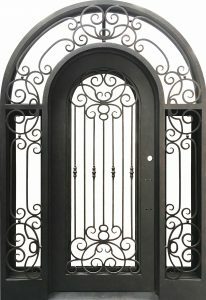 Composed of 12-gauge steel frames and panes with five-eighth-inch solid steel scroll work, our wrought iron security doors are robust bulwarks that can hold up to serious attacks and provide a gorgeous appearance at the same time. Behind the ironwork are five-eighth-inch panes of low-e insulated glass that can be made either clear, in order to provide an unobstructed view to the outside, or opaque, in order to preserve your privacy while still allowing some light inside. Although they are made from thick, secure solid steel, our doors are quiet and easy to open, mounted on heavy-duty barrel hinges with grease fittings that don’t get squeaky and provide minimal resistance to opening when you want to open them. There’s a nearly infinite variety of gorgeous designs that can go into the scrollwork of a quality iron door. It would be impossible to make an informed decision on what you would want on your own home without looking at some for yourself beforehand. At our showroom, the largest for iron doors in the state of Arizona, you can compare styles, finishes, door sizes, glass styles and other options both for security and style so that you can decide which door is best for you. Ultimately, you can discuss customizing your own iron doors by either coming into our office in person or discussing it over the phone. Your front door is both a security and stylistic priority. They’re an expression of your aesthetic sensibilities and protect the easiest point of entry into your home from potential attacks. 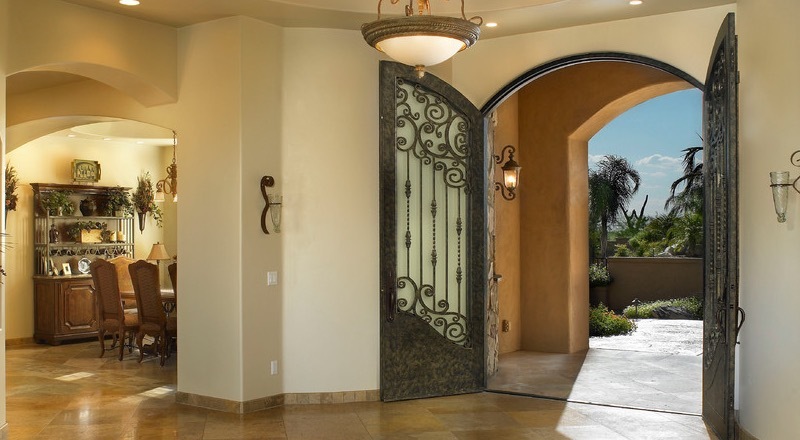 We’re the leaders in wrought iron security doors in Phoenix, Arizona, so if you’re interested in improving the security of your own home get in touch with us and we can help you work out a personalized door for you. Do Iron Doors Save Energy?